Didier Deschamps was ready to select Dimitri Payet in France's World Cup squad before injury struck for the Marseille attacker during Wednesday's Europa League final. 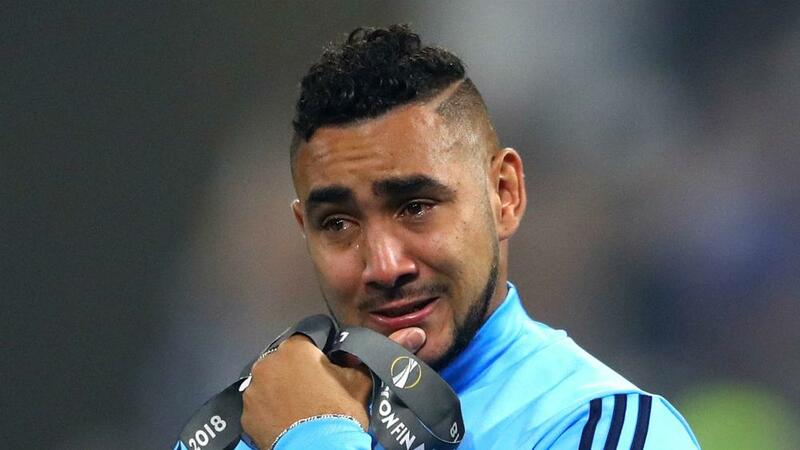 The Ligue 1 side slid to a 3-0 defeat against Atletico Madrid in Lyon, with their performance deteriorating after Payet left the field in tears after half an hour. Other high-profile omissions such as Manchester United forward Anthony Martial and Arsenal striker Alexandre Lacazette have been axed on grounds of form but, in Payet's case, Deschamps confirmed a newly acquired hamstring injury counted as too much of a risk. "He was a serious candidate for a position in the 23," Deschamps told TF1 after naming his final party for Russia 2018 on Thursday. "He played the first half-hour of the Europa League final and his situation worsened. It will take him at least three weeks to recover from this injury. "There is a significant risk of a recurrence for a muscle tear. When considering my deadlines, unfortunately for Dimitri, it will not be possible." Deschamps had a lavish collection of riches to select from in attack, with Antoine Griezmann, Kylian Mbappe, Nabil Fekir and Olivier Giroud representing a formidable and varied array of options for his forward line. As such, Martial and Lacazette were made to pay for underwhelming campaigns in the Premier League. "They were good against Germany [last November], but that was only one match. That aside, they were a bit less [good]," Deschamps said at a news conference. "It is a total analysis regarding what they could have done in certain situations, and in terms of what role they might have had in the squad. "I consider Giroud, Griezmann, Fekir and Mbappe as central attackers. Kylian and Antoine can play in other positions. Kylian is best centrally." Considering his stance on Payet, it is perhaps surprising Deschamps opted to select Benjamin Mendy. The Manchester City left-back has made a full recovery following cruciate knee ligament surgery last September but only featured as a substitute during the closing weeks of the campaign for the Premier League champions. Deschamps is confident over the 23-year-old's recovery but will not hesitate to call upon his reserve list if needed. "Benjamin is coming out of a long and serious injury," he added. "He is cured, it is a certainty. "The list that will count is on June 4 at noon [FIFA's final deadline for World Cup squads]. I can change any of the players at any time. "With the 15 days of preparation and friendly matches that we have, I'll know a little more. Benjamin has athletic qualities beyond the average, but to be sure he can play 90 minutes, it will take time. "We will make sure to see that with the staff. We followed him medically. There is a risk today, but we will make sure that there is a little more certainty by June 4."